COUNTY Down toddler groups are being asked to show they are ‘Top of the Tots’ by entering the UK’s biggest parenting awards. The prestigious competition, run by UK’s largest parenting site Netmums.com, will see three local groups scoop gongs before going through to the regional heats of the national awards. The top three national winners will then be crowned the UK’s best toddler groups, taking home a bumper £250 cash prize each. 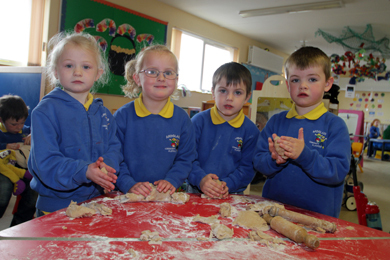 Pupils of Ardglass Community Playgroup having fun at the play-do table. The competition is open to all not-for-profit Northern Ireland toddler groups including those held in local libraries, church halls and children’s centres and other venues. The awards have been launched to recognise the hard work of parents and volunteers who give up their time to run the get-togethers, which are a vital part of our local community. Voting began on April 22 and over 1.2 million mums, dads and childcarers are eligible to cast their vote, making it the nation’s top prize for toddler groups. So still plenty of time to enter and vote! Netmums.com NI editor Jill Harland is now urging NI toddler groups to enter and ensure our area is recognised nationally. Jill said: “Northern Ireland is a fantastic place to bring up young kids with new families. Our toddler groups are a lifeline for mums with many parents meeting new friends who then stay friends for life. Winning Northern Ireland groups will be honoured on the site that has over a million users every week. They will receive a special certificate to display in their group before being put forward for the national award. Nominations are open until 7 June on Netmums.com with the local winners listed shortly afterwards. To enter all parents have to do is find the listing for their favourite group, press the ‘Like’ icon on the site or add a review about the group. Netmums founder Siobhan Freegard said: “From every home-baked cake to crayon drawing, toddler groups are a vital part of parenthood. Not only do they provide a place for parents to forge friendships, they help children learn how to play and grow together.